To go along with the three cards from 2017-18 Upper Deck Ice that I posted on here the other day, I was also able to find two from the previous year's set at my most recent card show visit. These both came from the same seller and were 20 cents each. As with most Ice sets, this one is on printed on the acetate material. They are always easy to spot in the boxes of singles at the card shows. 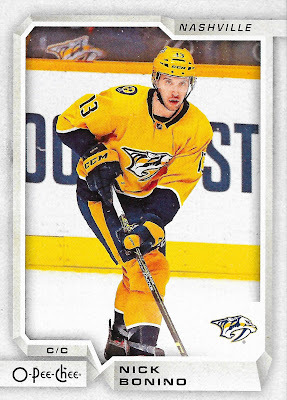 I sorted through a huge stack of these things, but was only able to find the two Preds. The first one is card #18 in the set and adds to my growing P.K. Subban collection within my Predators collection. Along with Viktor Arvidsson, he is one of my favorites on the team. Subban is shown here in the Preds old road jersey, which looks great against the background design. I also like how the blue stripes on his socks almost align perfectly with the v-shaped stripe that runs across the card. 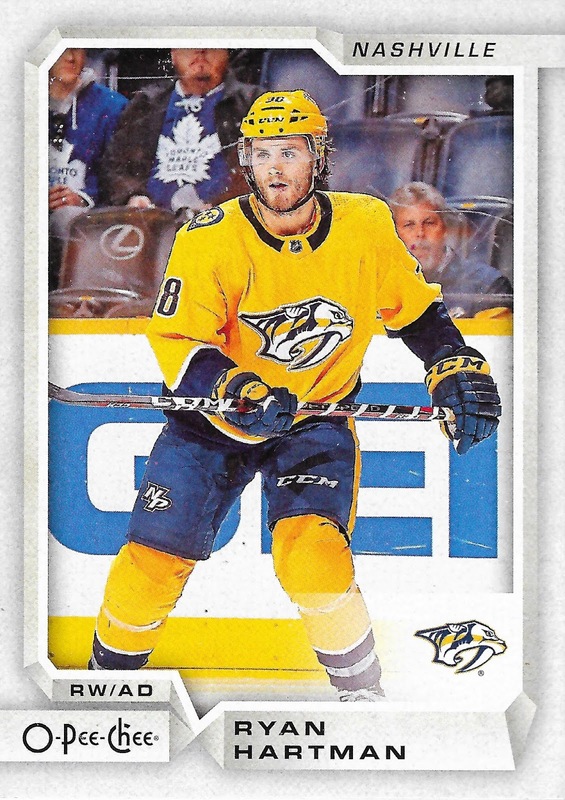 Then there was James Neal on card #66. 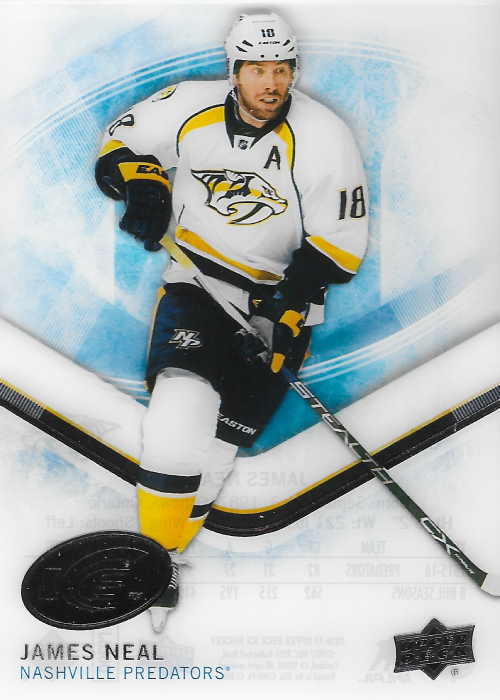 He is also shown in Nashville's old road jersey, which again looks great with the background of this set. As much as I like their new uniforms, I kind of miss these ones as they always remind me of the 2017 Cup Final run. I'm getting closer to the end of my second round of card show pickups for 2019. I've got a couple more sets of Preds stuff to get to then a few more for the Golden Knights. I want to get through these relatively quickly now since I have a couple of recent eBay purchases I'm really looking forward to sharing on here. 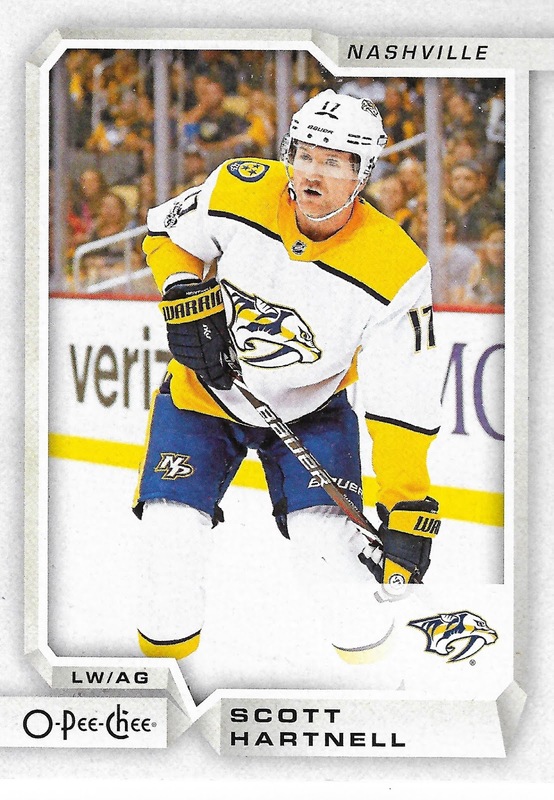 If I had to choose, Viktor Arvidsson would be my favorite current Predator. It seems like any time he is on the ice there is the potential for an exciting play. It definitely helps that he's usually on a line with Filip Forsberg and Ryan Johansen. He's leading the team this season with 33 goals despite only having played 56 games so far. 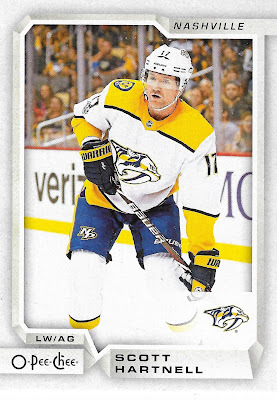 I don't have a ton of Arvidsson cards in my collection yet, so it was nice to grab a couple at recent card shows. 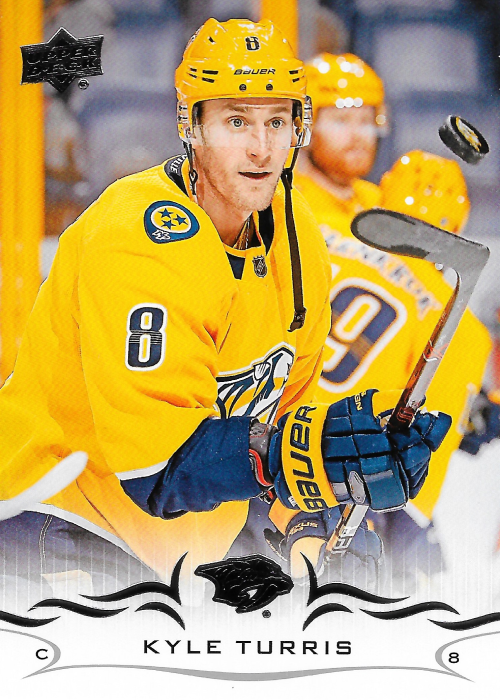 Today's card comes from 2017-18 Upper Deck Overtime. This one is card #28 in the set. It shows Arvidsson playing during the 2016-17 season. I haven't seen much of this set before so it was kind of nice to be able to add something a little different to my collection. Now I will just have to see how many other Predators there are in this set so I can search for them at the next card show. I like the overall look of this set. The Overtime logo is a bit hard to see in the scan because of the silver foil, but other than that everything has a nice clean look to it. Its the first week of April now and I'm still working on posting my latest card show pickups from February. Since then I've even bought a few things on eBay that are sitting in a pile waiting to be scanned. Its kind of nice have a backlog of stuff to post here so I can really do a new post whenever I feel like I have time right now. That is just not all that often lately. 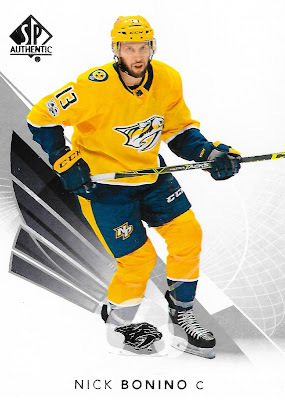 I figured my lunch break today was a good time to show off some new Predators cards from 2017-18 Upper Deck Ice. These three all came from the last dealer I visited at the show and each one only set my back 20 cents. Not a bad deal if you ask me. 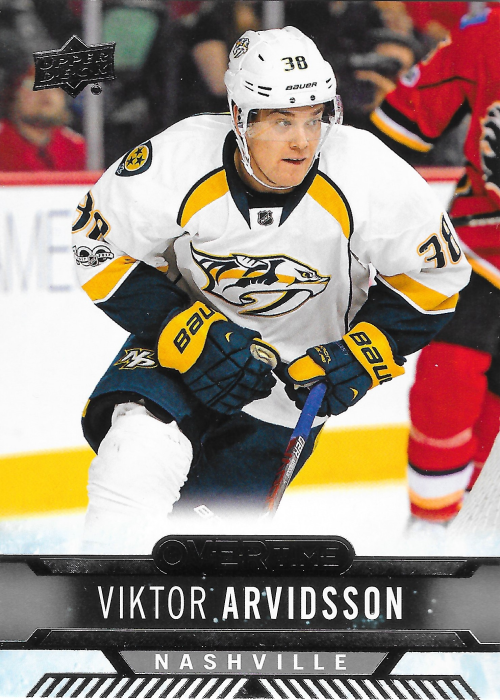 Up first is Viktor Arvidsson on card #67 of the set. I love the overall look of this edition of Ice. The blue really works well with the Predators colors. Veteran and now former Predator Scott Harntell is on card #2. 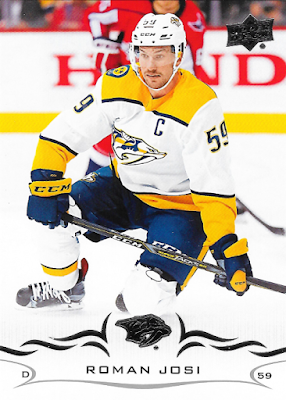 He is also shown in the Preds away uniform, which helps contrast against the blue background. Last but not least, Filip Forsberg is the focus of card #15. 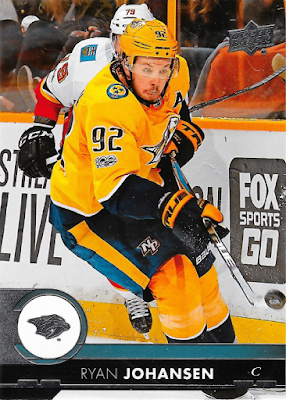 This one has a great shot of Forsberg looking like he either just made a pass or is about to receive one. The only bad thing about this set is what happens when you try to scan them and the printing on the back reads right on through to the front of the card. They also look a lot nicer in person than they do in the scans. 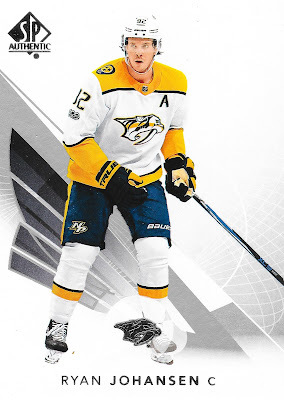 I haven't checked the official list, but I'm sure there are at least a couple more Preds I will need to complete the base team set. Maybe I'll get lucky and find them at the next show. So I just read Upper Deck's facebook post about 2019-20 MVP and there is one thing that has me really excited for this when it comes out. Normally MVP hasn't been on my collecting radar much the past few years because I've never really been thrilled by the design. I do however really like the original MVP designs from back in the late 90's. I bet you can figure out where I'm going with this based on this year's MVP release. 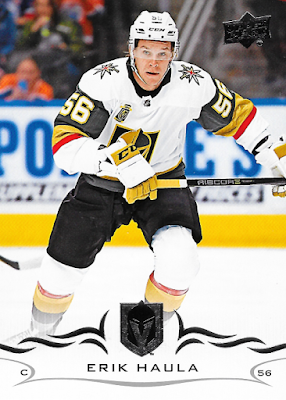 The 2018-19 version has some awesome tribute cards to the original 1998-99 MVP set. While I haven't chased those at all, I have thought about trying to get just a few. Those original MVP sets were some of the first hobby boxes I bought for myself as a young collector. Seeing those designs always brings back good memories. 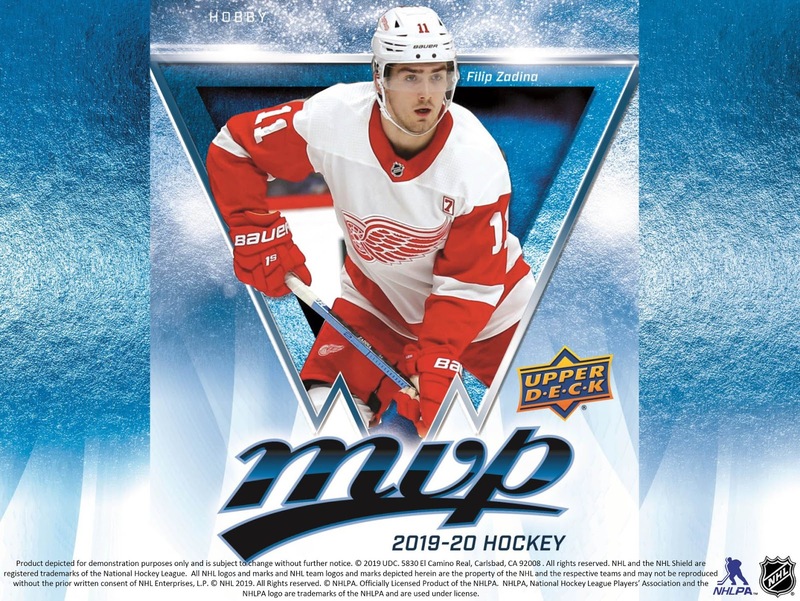 On a side note, its pretty cool that they have Filip Zadina of the Wings as the cover athlete for this set. Now for where I was going with this. 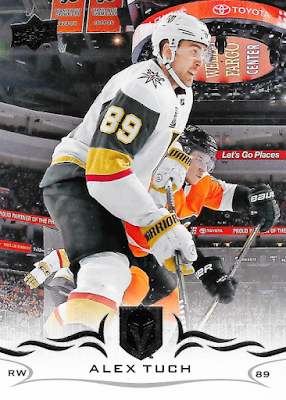 Upper Deck is in fact bringing back the tribute cards, this time for the MVP Stanley Cup Edition set as shown by the second page of the sell sheet below. The 1999-00 set was the original reason for me even starting this blog. While I'm still actively working on the original SCE set, it has kind of stalled out on me lately. They are just not as easy to come by now for whatever reason. I feel like this new 100 card set would be a good way to jump start some new interest in the project. I do wonder though how this will affect the original set. Would they become more or less desirable with another version floating around like this? The thing I like most about the original MVP SCE set is that it was unique. There was also a regular MVP release the same season. 1999-00 was the only time they've ever done the specific Stanley Cup Edition. It is still my favorite Upper Deck set to this day. I just hope the finished product looks better than this mock up with Patrick Kane. As of right now, I'm thinking that I will want to go after both the Silver Script and Super Script tribute sets as they would go perfectly with the original set I'm working on. Anyone else excited for 2019-20 MVP? I'm still working on getting my most recent card show pickups scanned and posted on here. I have about 35-40 cards to get to between the Predators and the Golden Knights. It might take a while though as I plan on spreading these out and I really just don't have the free time to crank these out as fast as I would really like to. 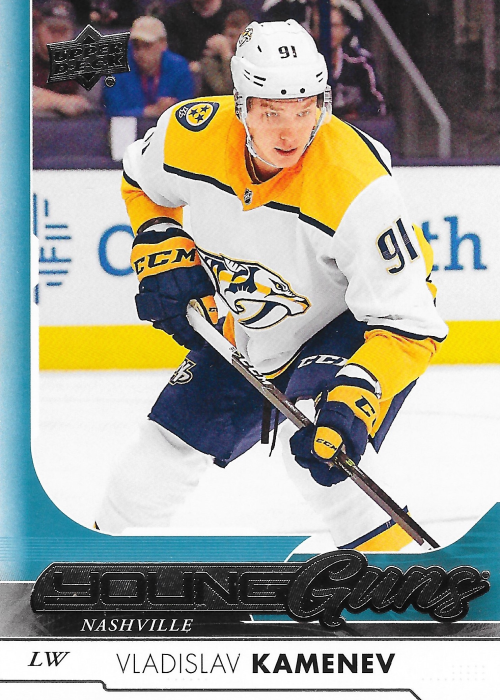 For today's post I've got a Vladislav Kamenev YG rookie card from 2017-18 Upper Deck. 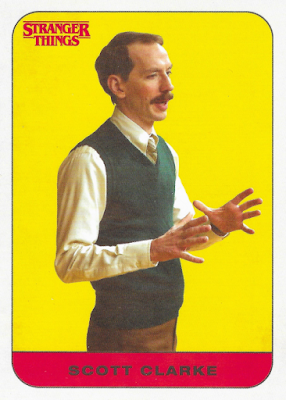 This one is card #238 in the set. This is also the first YG I've added to my predators collection. I'm thinking I might want to get all of them now, at least from 2016-17 onward. This only set me back $2 at the show. Not bad considering he is no longer even with Nashville. I had forgotten that he was dealt to Colorado as part of the trade that brought in Kyle Turris from Ottawa. Still a nice addition to the collection though. Hopefully the title gave this one away pretty quickly. 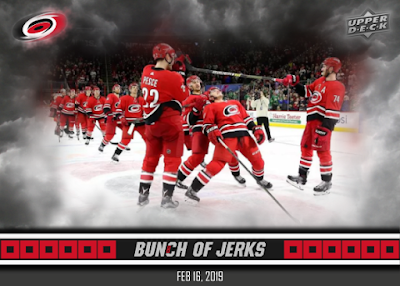 I absolutely love what the Carolina Hurricanes have been doing with their Storm Surge celebrations after victories on home ice. I don't see what the problem is with a team trying to have some fun. Some people might not agree with that, but that's just how I feel. 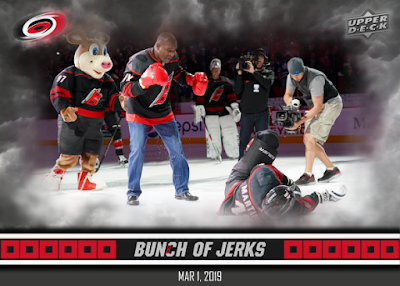 Same thing with the over the top pre-game shows that Vegas put on during last year's playoffs. I loved watching those and don't understand how so many people had such a huge problem with it. Anyway, back to the reason for this post. Its been a while now since I came up with a custom hockey card design. My last two projects were music based. What better way to get back into this than with everybody's favorite bunch of jerks? I wasn't really sure where to start with this one other than wanting some type of storm cloud background. Once I found that I kind of just winged it from there and after several iterations ended up with a design I was happy with. Before I talk about some of the details, here's a look at the first one of the seven I have so far. I think these came out great, much better than I thought they would. The horizontal orientation was definitely the right way to go. I had played with the idea of a vertical design, but it never looked right so I scrapped that idea pretty quickly. 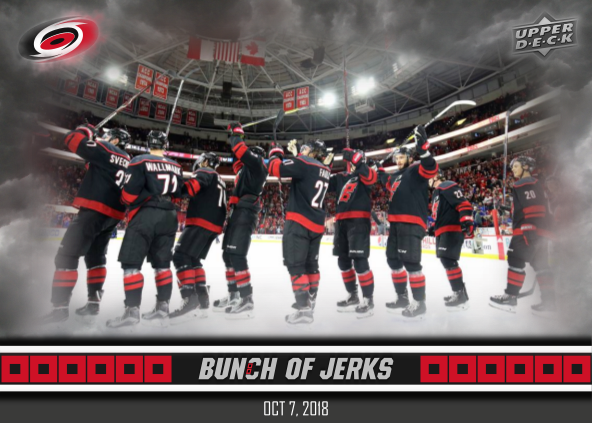 Each card showcases one of the Hurricanes' Storm Surge celebrations. I tried to find a good quality photo so it was evident pretty quickly which celebration we're looking at. The first one was a bit tricky so I went with a great shot of the players getting the crowd going. This was just before they all skated toward the end boards and jumped into the glass. 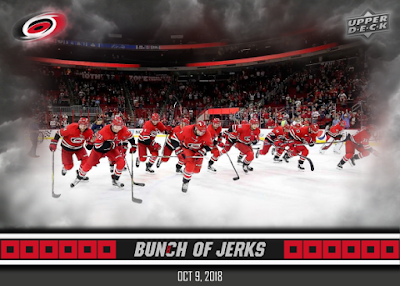 As far as the overall design, I wanted to incorporate the Bunch of Jerks text from the t-shirts as well as the Canes colors and logo. I also added the Upper Deck logo just because it was easy to find and it gives the design a bit more realism, even if it is something that they would likely never make. I did the same fade effect as the Hurricanes logo to keep things consistent. Each card also has a date on the bottom. This was just to give each card something that would be unique from the rest, other than the picture of course. I tried going with a full description similar to UD's recent game dated moments, but it just looked too crowded. Up next we have a look at the second Storm Surge that took place on October 9th after the Hurricanes beat the Vancouver Canucks 5-3. This was similar to the first one as the players skated down the ice and jumped into the end boards. Here is a link to the video. After their 3-1 win over the Flyers on New Year's Eve, rookie Andrei Svechnikov went for a nice long slide from center ice, through his teammates lined up on either side, and into the empty net. Here is a link to the video. Looks like fun, doesn't it? Up next is one of my favorites. After a 4-2 win over the Blue Jackets, the players gathered in a circle at center ice with Brock McGinn in the center. McGinn does his best Thor impression and the rest of the team falls to the ice. Here is a link to the video. This one is an example of when I had to settle for a picture of the aftermath rather than the core of the Storm Surge. After a 3-1 victory over the Oilers, Warren Foegele hits a walk-off home run and gets drenched with Gatorade by his teammates. Here is a link to the video. It was also pretty neat when they did the limbo after beating the Stars 3-0 back on February 16th. Brett Pesce and Jaccob Slavin led the way using a stick as the limbo bar and everyone else got in on the action including the team's mascot. Here is a link to the video. Last but not least is one of the more interesting Storm Surges. After a 5-2 win over the Blues the Hurricanes were joined on the ice by Evander Holyfield. Jordan Martinook was the lucky one who go to face off with the heavyweight champ. Here is a link to the video. That's all for now. 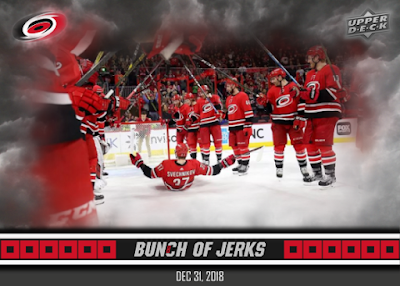 I'm working on some more of these and hopefully I'll be able to post an update later this season. There are a few more celebrations that I really enjoyed that would make for good cards. It will be interesting to see what happens if they make the playoffs. I've been rooting for them lately just because I want to see these in the playoffs. Ever since my recent blaster box of Stranger Things season one cards, I've been wanting to complete the base set. There are only 100 cards in the set and I got a good chunk of them from the blaster. I didn't think $20 for another blaster was worth it just to end up with a ton of extras so eBay way my next option. I did some searching and was able to find a nice little lot of 56 cards for just $0.99 plus shipping. The only catch was the seller did not include a list of what card #'s were included. I'm sure I could've asked them, but I figured what the heck and put in a bid. Luckily, I ended up winning with that lone bid and I would be that much closer to finishing the set. Rather than showing all of the cards here, I figured I would pick three of my favorites. They are all of the horizontal variety are shown in numerical order, which also happens to be chronological order as far as the story on the actual show. The first one titled "The Demogorgon Got Me" is card #2 in the set. This scene takes place as the boys are finishing up their night of Dungeons and Dragons. 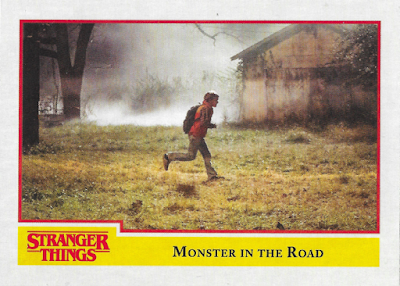 The next one titled "Monster in the Road" just happens to be the next card in the set. This scene takes place shortly after the previous one as Will is being chased by the monster. The last one jumps a bit toward the end of the season. Card #93 in the set titled "Into the Upside Down" focuses on Hopper entering the upside down with Joyce to save Will. After sorting through everything, it turns out that I only ended up needing 27 of the 56 cards for my set. Oh well, its not the end of the world since I did only spend a few dollars on this lot. Now I just need to track down the remaining base cards to finish the main set. I've been to two card shows this year now and have come away with a good number of singles for my new Predators collection. Rather than throwing a bunch of different sets into one long post, I thought I would try to break things up a little more moving forward. Its easier for me to find time for a quick post with just a card or two. P.K. Subban is once again the focus here. This time I found a Spectrum FX insert from 2016-17 SP Authentic for just $1. This one is card #S-23 in the set and is not serial numbered. It is the standard version, but apparently there are gold parallels out there numbered to 50. Those were available through the Upper Deck bounty program. This card looks a lot better in person than it does in the scan above. There are some really cool effects that change as the light hits the front of the card. Its actually a pretty nice design overall. 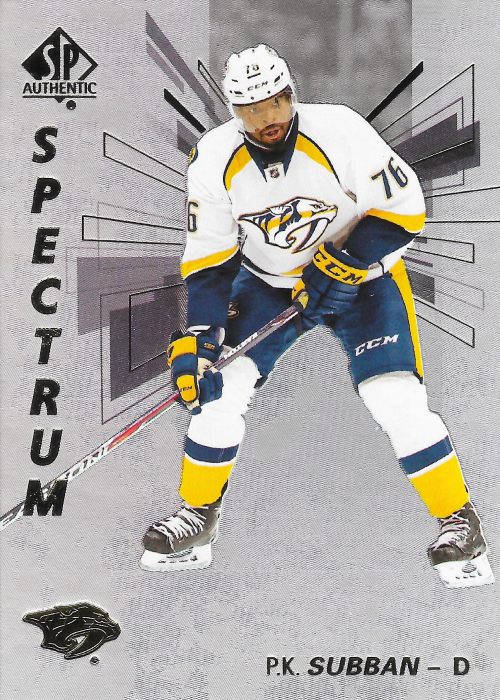 I like how the photo is a bit off center, but still lines up with all the random shapes emanating from behind Subban. Its also nice that they cropped Subban from the background of the original photo. That definitely helps the picture stand out from the rest of the design. I do think it would look even better if they had shown him in the gold home jerseys from that season. Upper Deck Artifacts is one of those sets that seems to always have a ton of parallels. I kind of like that, especially for my player collections. It gives me a few more cards to chase and its always fun to line up the different parallels and get a look at them together. For the 2017-18 edition, there were several different parallels available: Ruby (#/299), Emerald (#/99), Orange (#/55), Purple (#/20), and Black (#/5). That's a nice variety and they would make for an awesome complete rainbow. Who doesn't love complete rainbows? Anyway, I was lucky enough to find one of these at my second card show of the year a couple weekends ago. This ruby parallel featuring P.K. Subban is card #101 is the set and is serial numbered 013/299 on the front. I was able to get it for just a few bucks. 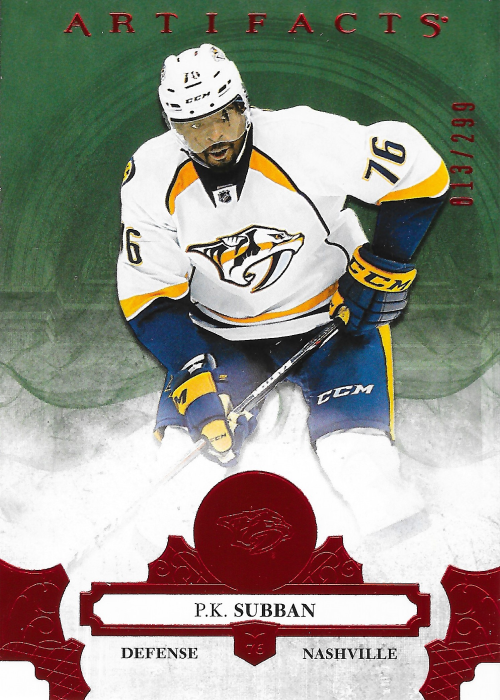 This one will go nicely with the Subban OPC Platinum Red Prism parallel that I got from Chris over at The Collector back when I was just starting my Predators collection. 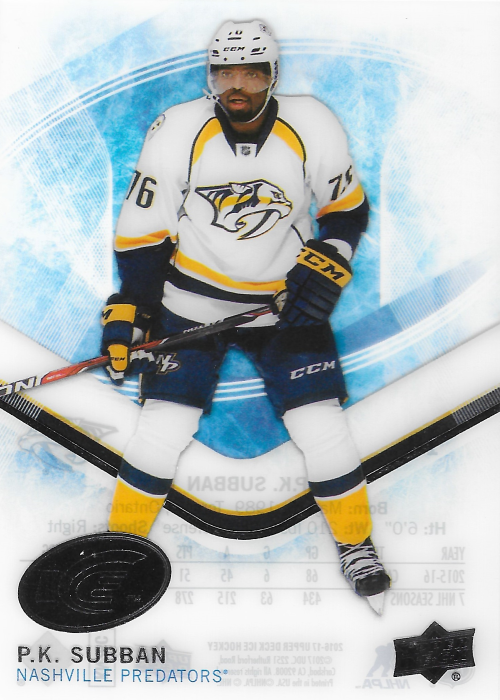 While this set is from 2017-18, Subban is shown playing during the previous season. This is evident by the old away jersey that he only wore for that one season. I have to say I miss that set of uniforms from Nashville. The ones they have now are a little too simplified. I'd give a slight edge to their current away jersey. I know I've caught the collecting bug again when I start branching out into things that are outside the world of hockey cards. I've dabbled in a few non-sports sets in the past (e.g. Lost and Jericho), so I'm always on the lookout for anything trading card related to my favorite television shows. For whatever reason, I really like these kinds of sets. Anyway, a few weeks ago I was shopping at the local Target and upon inspecting the trading card section, I was pleasantly surprised to see a blaster box of trading cards for my current favorite show: Stranger Things. I know some people aren't all that into this show, but I love it. Season one was great and I think season two was even better. Now I'm anxiously waiting to see what happens when season three is released on July 4th. I wasn't even aware of this set until now. Apparently, it was released around the end of October 2018, which is interesting because season one of the actual showed debuted on Netflix all the way back in July of 2016. Better late than never I guess. As I've done with my previous box breaks, I wanted to show the front of the box itself. The bright yellow color is what really made it stand out on the shelf at Target. 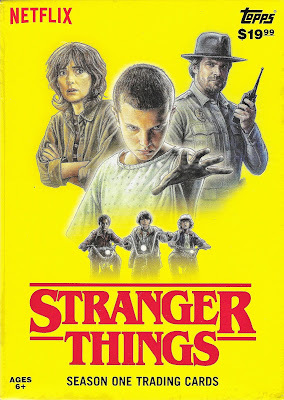 Beyond that, it has painting like images of the main cast over top of the iconic Stranger Things wordmark. There are some cool autographs and memorabilia available in the hobby boxes, but I'll leave those off of here for now since this was a retail blaster. 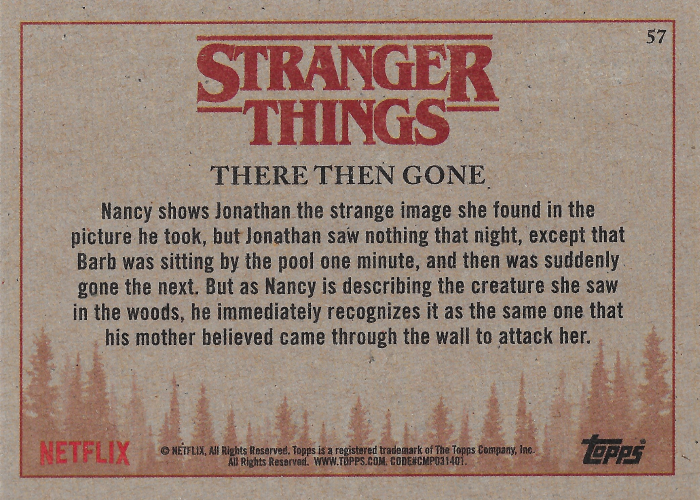 For more information on the hobby version, click here for a great breakdown from Cardboard Connection. Before I get to scans of the actual cards I pulled, I thought it would be neat to show the wrappers. These are something that you don't get to see that often when box breaks are posted online. Maybe not the most exciting thing, but still interesting to me. On the left you have the main packs. The design uses the same yellow as the box, but has a slightly different look to the picture. The black behind the Stranger Things text and the black silhouettes are a nice touch as well. On the right is the pack that contained the one commemorative patch card. Not as exciting as the other one. Now its time to get into the good stuff. I'll start with the base cards. I was able to knock 57 of these off the list. As far as I can tell, there were no duplicates. They are printed on the old school card stock so they definitely feel like they came right out of the 1980's. There were both horizontal and vertical base cards, which seems a bit odd to me. You would think for a set like this they would've kept everything the same. Below is an example of one of the vertical designs. This one titled "Signs of a Struggle" is card #12 in the set and focuses on Hopper searching the Byers' shed for any signs of what may have happened to Will. I love the simplicity of the design and the bold colors. 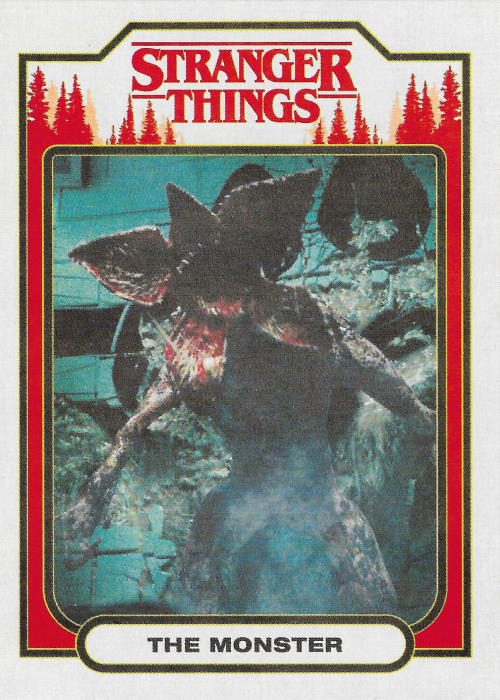 Seems like it would fit right in with any other Topps set from the 80's. If you ask me, the horizontal cards look just a little better. I guess because this is for a television show after all, the horizontal design better accommodates the widescreen shots you would see on TV. 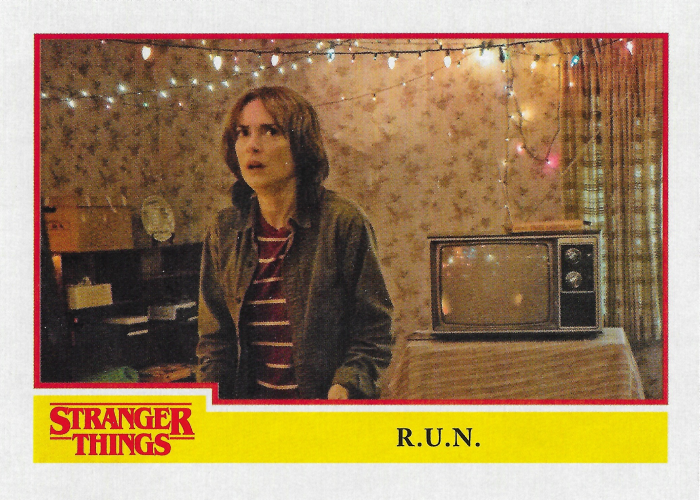 The example below is card #46 in the set focusing on the time when Will spells out the word run via the Christmas lights Joyce had strung up on the wall. The backs of the cards are all the same horizontal design. Below is an example. I really like the simplicity here, nothing seems unnecessary. It has a nice and quick description of the scene shown on the front. The trees on the bottom are a nice touch. Unfortunately, I wasn't luck enough to pull any of the base card parallels. 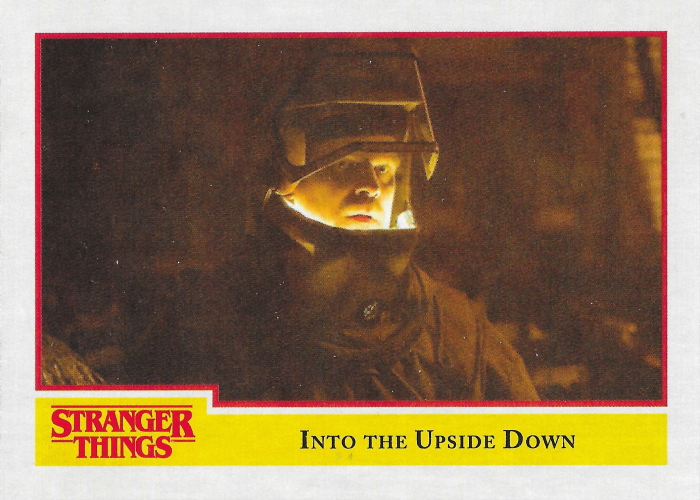 That's too bad because I really wanted one of the Upside Down (#/99) or Waffle (#/11) parallels. They look pretty sweet from the scans that I've seen on eBay lately. And that's right, I did say waffle. You'd have to be familiar with the show to understand the reasoning for that one. 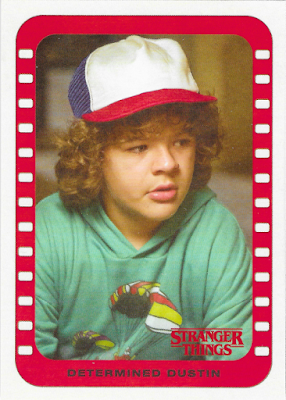 For the character cards, I ended up with three: Steve Harrington, Mike Wheeler and The Monster. 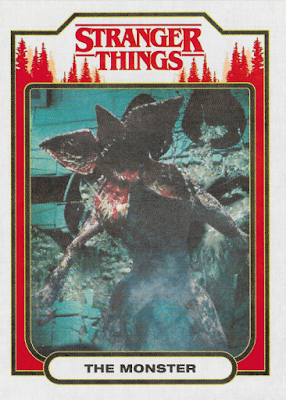 Here's a look at The Monster, which is card #20 of the 20 card insert set. For the character stickers, I ended up with eight of the twenty: Scott Clarke, Will Byers, Dustin Henderson, Benny Hammond, Ted Wheeler, Barbara Holland, Jonathan Byers and Eleven. These are a pretty simple design, but look great with the bold color combination. These kind of remind me of Topps hockey cards from back in the 60's and 70's. 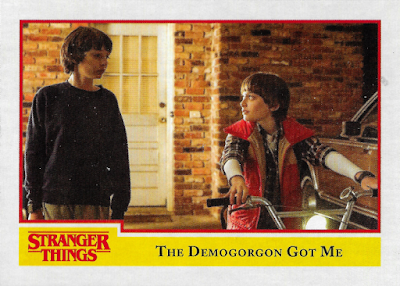 For the scene stickers, I ended up with two of the ten: Goin' for a Ride (Will Byers) and Determined Dustin. These are neat because the have the film reel look to them and definitely stick out with all the red. The only thing is that it does not have any kind of description on the back, just the basic set information and sticker number. I saved the best for last. 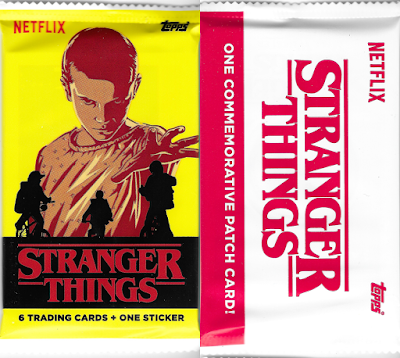 Each blaster box comes with one commemorative patch card, also known as a manufactured patch. I know some people hate these things and I would tend to agree for anything like this taking the place of a piece of actual game-used memorabilia as a "hit" for a given pack or box. However, in this case I think these are great. It almost feels like and added bonus for a blaster like this. These are actually pretty cool to see in person. They are nice and thick and the patches look great. 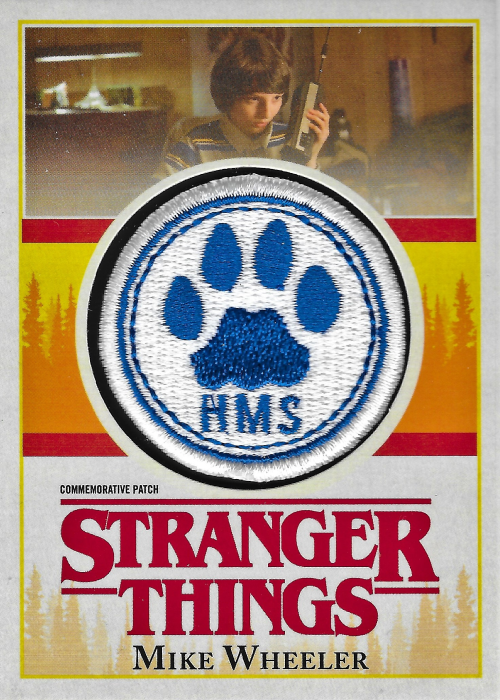 This one with Mike Wheeler has a Hawkins Middle School patch. The blue and white provide a nice contrast to the rest of the card design so the patch really stands out. All in all, this was a fun break. 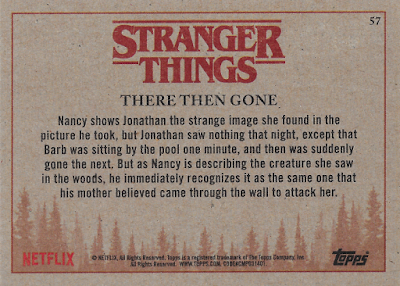 I got some new card for one of my favorite shows and since I haven't seen the first season in a while now, it was nice to look through the set and see some key moments from the show. Now I just need to complete the base set. 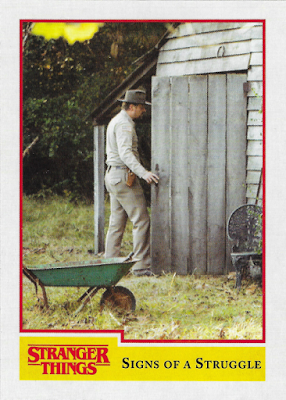 Also, from what I've read, it sounds like Topps will be producing another set like this for season two. Definitely going to looking at getting at least a blaster of that as well. Anyone else into Stranger Things, the show or the trading card set from Topps? Time to get back to my other new favorite team, the Vegas Golden Knights. I've been saving these for the last post of the card show pickups from a few weeks ago since they are a bit nicer than the Parkhurst cards from my last VGK post. 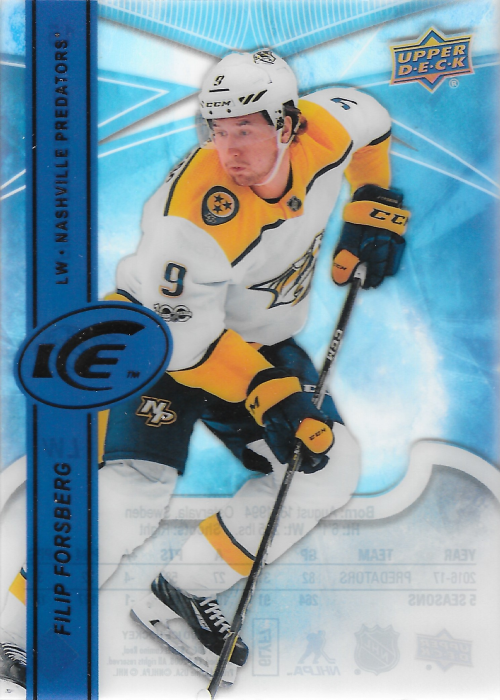 As the title of the posts suggests, these are all from 2018-19 Upper Deck. First up we have card #237 featuring Zach Whitecloud. 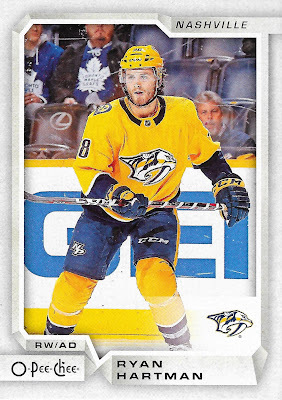 This is first time in what seems like forever that I've bought a Young Guns card for myself. The last few were for my Gallimaufry project, so its nice to get some that actually belong to one of my team collections. Whitecloud is an undrafted defensive prospect for the Golden Knights. 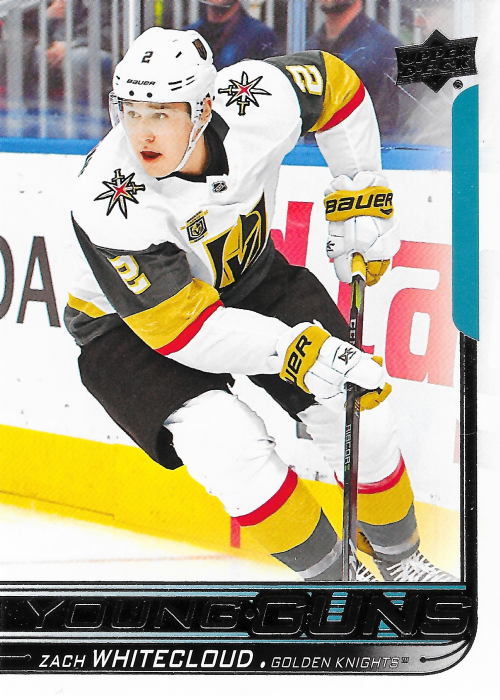 He's only ever played in one game for Vegas and that was back in April of 2018. Since then he has been with the Chicago Wolves of the American Hockey League. Click here for a nice article on NHL.com from back when the Knights signed him to a 3-year entry level deal. 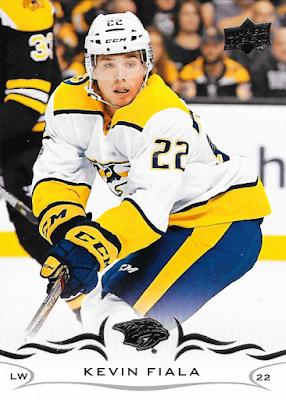 Up next is another Young Guns, this time card #224 featuring Tomas Hyka. I'm a little more familiar with Hyka as he's played in 27 games so far over the last two seasons. He was originally drafted by the Kings back in 2012, but never signed with them. Hyka was signed as a free agent by the Golden Knights back in June of 2017, making him the player in the team's history after Vadim Shipachyov and Reid Duke. Now we're onto the regular base cards. Up first we have card #183 featuring Erik Haula. This one is another great example of the photography you can expect from the flagship Upper Deck release year after year. I really like how the background is slightly blurred so the player image stands out. 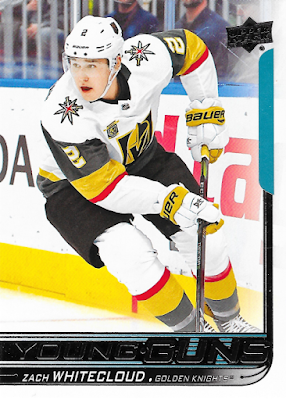 Last but not lease we have card #178 featuring a really neat low angle shot of Alex Tuch. It's not every day that you can see the underside of an arena's scoreboard on a card. You can even see a little bit of some banners hanging from the rafters in Philadelphia. These four bring my Golden Knights total to seven. Not as many as I would like to have by now, but I'll take it and continue to be on the lookout for more. 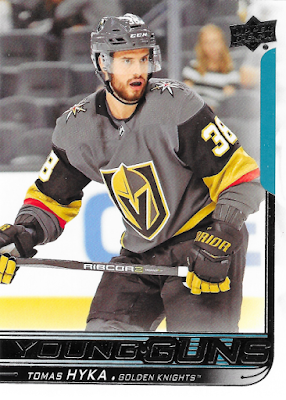 If anyone has unwanted Golden Knights cards, or Predators cards for that matter, I'd always be up for some base-for-base trades. I've got tons of cards from the other 28 teams that I'd love to get rid of. This post wraps up my Predators pickups from the first card show of the year. Even though they have been primarily base cards, its still fun to add them to one of the newer projects in my collection. These are all from 2018-19 Upper Deck and came from 10 cent boxes. My favorite of this group is card #107 featuring Ryan Johansen. It's got an awesome shot of him celebrating another goal in Smashville. I do like that the main Upper Deck set mixes in horizontal cards with the standard vertical ones. This gives the set some nice variety and an opportunity for some excellent photography. Up next we have another great horizontal card. 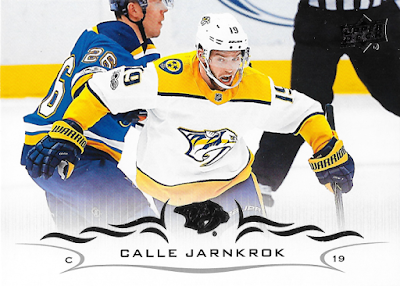 This one is #102 and features Calle Jarnkrok. Gotta love photos like this one that showcase the intensity these guys play with. 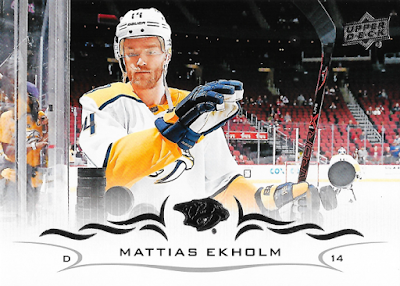 The last of the horizontal cards is #106 featuring Mattias Ekholm. While I understand they are trying to mix things up with a photo like this, I've seen this exact same type of shot on quite a few cards. By that I mean the knocking over of the stack of pucks during warm ups. Card #101 featuring Kyle Turris is another example of a type of shot that's been on plenty of cards. While its neat to see some of the players shown during warm ups like this, I would almost prefer in-game action shots over something like this. Roman Josi is featured on card #104. As I'm posting more and more of these, I'm starting to really like the overall design of this set. The curved shapes on either side of the team logo are a nice touch and I really like the way the images all fade out to white at the bottom. The recently traded Kevin Fiala is featured on card #105. This is another good in-game shot, the centering looks perfect too. If it weren't for Zdeno Chara taking up some of the background, this would have had a really clean look to it. So that's it for this run of additions to my Predators collection. I'm pretty happy with the progress so far. I've got a nice variety of sets represented and its been nice to actaully get out to a show and find these things the old fashioned way. Luckily the show that I got these from happens monthly and is only a few miles from my house. I definitely plan on hitting it up a few more times this year as new sets are released. Once the dealers have finished busting their boxes and cases, the leftover and mostly unwanted base cards can be had for a pretty good price. Definitely beats paying around $0.50 a piece from places like COMC. I'm finally getting close to the end of my first card show pickups of the year. Even though these have all been simple base cards, I'm really enjoying the whole process of finding, sorting and scanning them. I know they're not the most exciting things to show off on here, but they are part of my collection and represent the teams that I enjoy watching the most. For today's post, I've got two cards from the 2017-18 Upper Deck base set. The first one has an awesome shot of Nick Bonino about to take a face-off. Its really neat how they captured him staring right at the puck in the official's hand as it is about to be dropped. Close ups can be hit or miss. This one on card #354 is definitely a good one. 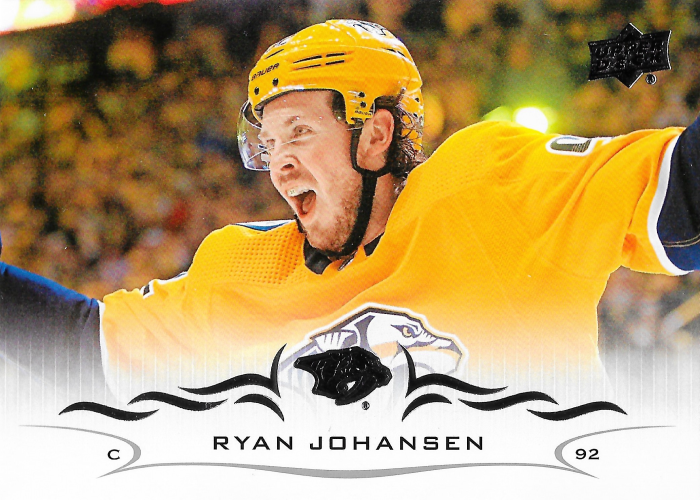 Up next is card #356 featuring Ryan Johansen. This one's got a great action shot of Johansen playing the puck along the boards with a Calgary player in pursuit. One thing I've noticed about this set is the blueish green trim that Upper Deck went with seems to go well with any team's color. All in all, I really like the look of this set. Hopefully posting these will bring the Preds some better luck in their next game as they were shut out 5-0 by the Avalanche last night. After this I've got at least one more post of Preds stuff from the show to get to. Now I just need to work on populating my collection website with all these new scans. My first card show on the year is definitely one that keeps on giving. Even though I only picked up cards for two of my projects, its been nice breaking things up into multiple posts. I enjoy writing these things and its a bit easier to fit in several smaller posts instead of one extremely long one with dozens of cards. 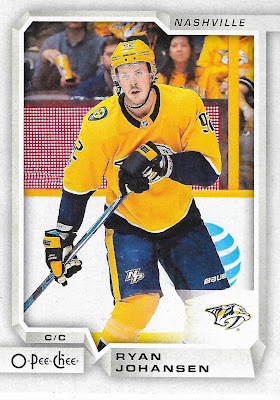 Continuing with my Predators pickups from the 10 cent boxes, I've got a half dozen cards from 2018-19 O-Pee-Chee. These are the first OPC cards I've gotten in a couple of years now. I have to say this design is pretty nice. Its definitely an improvement over some of the designs I remember from recent years. The first one of the group is #141 featuring Ryan Johansen. Up next is card #159 that features Scott Hartnell. 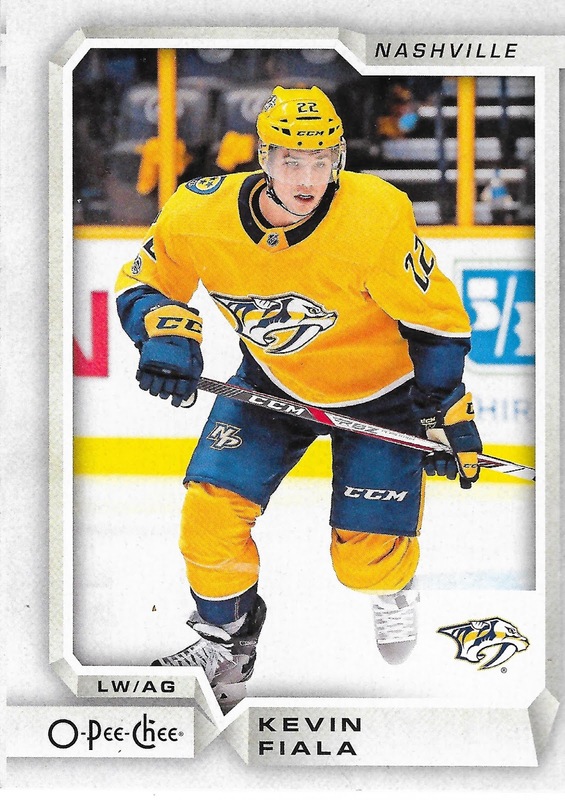 Kevin Fiala is featured on card #173. This one appears to have been cut slightly wrong. You can see some of the next card on the left hand side. 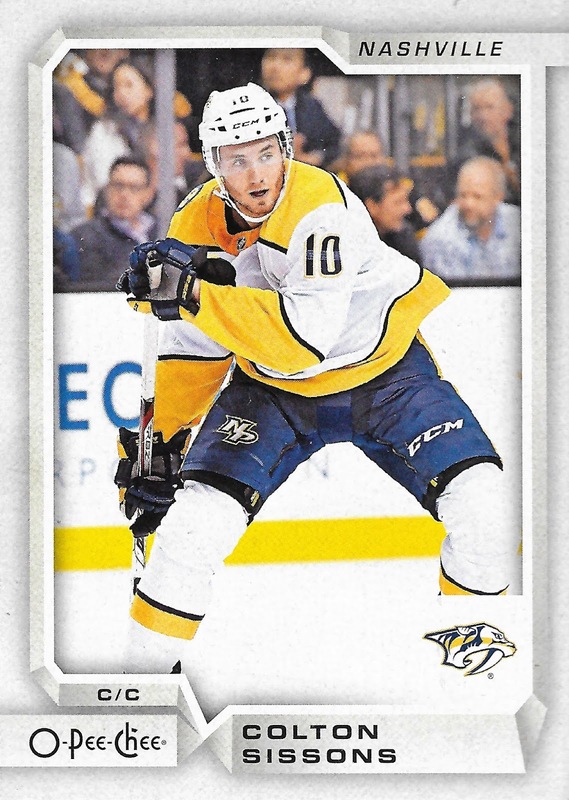 Card #357 is Colton Sissons. I will always remember him for scoring a hat trick in Game 6 of the 2017 Western Conference Final against the Anaheim Ducks. That was one of the highlights of that run for me as a new fan of the Preds. 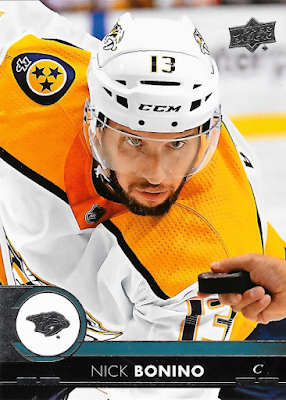 Nick Bonino is on card #399. 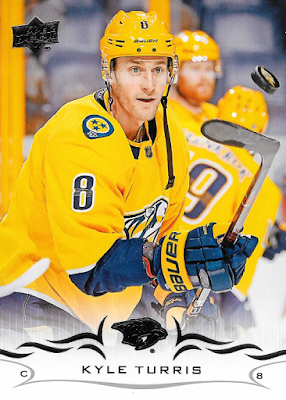 There is definitely a lot of gold in this photo between the Preds uniform and the top and bottom of the boards. The only thing that bugs me about that watching on TV is the slight difference in the color between top and bottom. 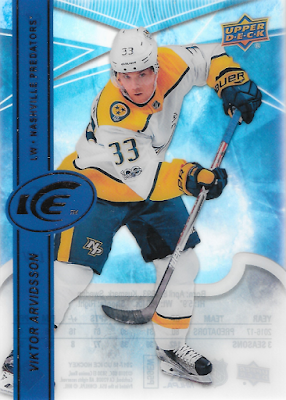 Last but not least we have one of the newer Preds, Ryan Harman, featured on card #419. I like how for all of these cards the photo focuses solely on the featured player. This just gives them a cleaner look in my opinion. Sure, they may not be the most exciting action shots, but they at least make for a nice overall look. 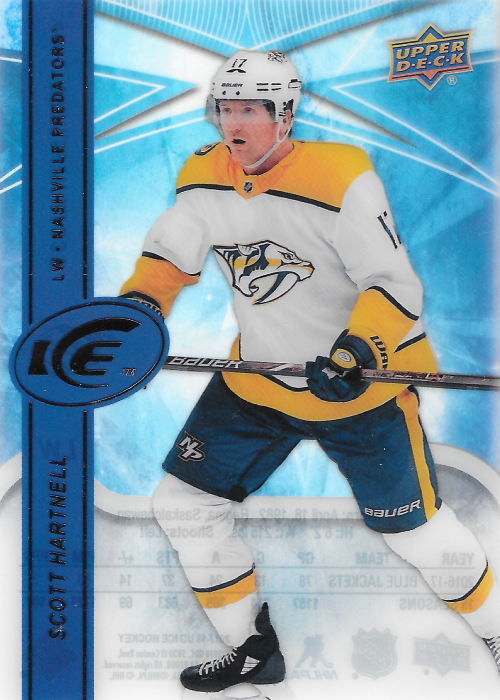 Since this is O-Pee-Chee after all, I'm still going to need quite a few more cards to complete the Preds team set. There are 20 of them in the main set, so I've got a ways to go. At least it gives me something to look for at the next card show.